Currently, Special Event Updates are available with Instant Traffic, Instant Buy, and Smart Popup. Note: Once you turn the feature on, the Special Event Updates will be activated in all 3 apps. To turn the feature on, from your app's dashboard, go to Settings at the upper right corner of the screen. Switch the "Automatic recreative with yearly events" toggle to turn on the Special Events Updates. Updating your store on special event reflects your effort to communicate with customers. Compared to a dust-cover store, customers would definitely prefer an on-trend and regularly updated store. Not only intriguing, the interestingly cute heart string remind customers of the products they added to cart, and can also encourage people to add products to their cart more, even just to rewatch the animation. 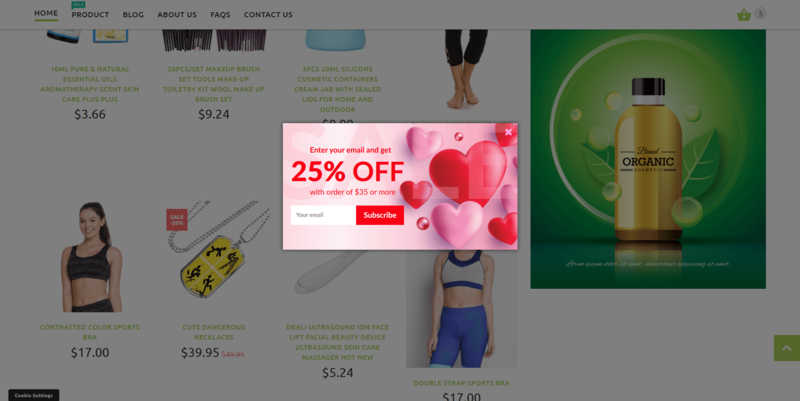 Join your customers in celebrating Valentine’s Day, at least with a new design for your popup. Cooperate with partners and drive traffic to your store while still enjoying the holiday. Eggflow's updates are customized for each special event of the year. Not only Valentine's Day, but Eggflow apps have also been gearing up to help you join other holidays with unique updates. Just get ready for it. These Special Event Updates are optional and will be off by default so that you can decide to use it or not. If you don't want any event update in your store, then rest assured. The Special Event Updates are only activated after you turn the feature on in Settings.